April is here! This month we're going to be bringing you a whole host of content from content polls 30 and 31 as well as an update on our plan for resizable. Let's get straight into The Month Ahead. It has been a while since we last spoke about resizable mode and now seems like a good time to briefly revisit the idea to give you a small update on the plans for resizable. Mod Ash is set to get started with resizable mode as his next big project. While the exact scale of the project is not too clear at this point, our aim is to release resizable mode this summer. You can see a preview of resizable mode in the below developer Q&A where Mod Jacmob shows off the progress he made. Note that this is not what resizable mode will look like in its finished form. There is still a fair amount of work to be done to properly implement resizable. We will provide more information on the progress of resizable mode regularly through the development process. For now, hold tight and look forward to this summer and the grand release of Old School resizable! Early on in April we will be releasing two new game modes in Clan Wars: Team oddskull and timed deathmatch. Voted in through the near miss poll, these new game modes offer two more ways for clans to show off their prowess. In a timed deathmatch clan war the clan that gets the most kills in a set period of time wins. The amount of time can be selected by the two players starting the war, allowing clans to choose just how challenging they want the war to be. A number of updates that passed in content polls 30 and 31 that are yet to be added to Old School are on the way and will be arriving throughout April. 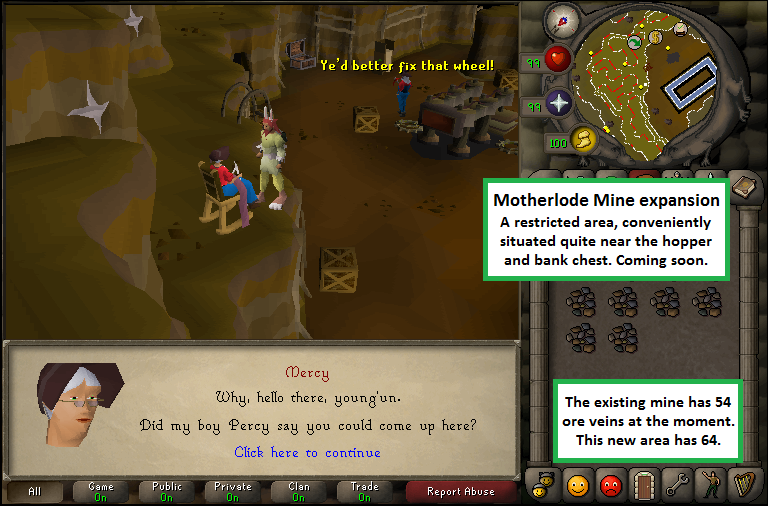 This includes the expansion to the Motherlode Mine that can be accessed by players with over 72 mining who've paid a one-off fee of 100 nuggets. 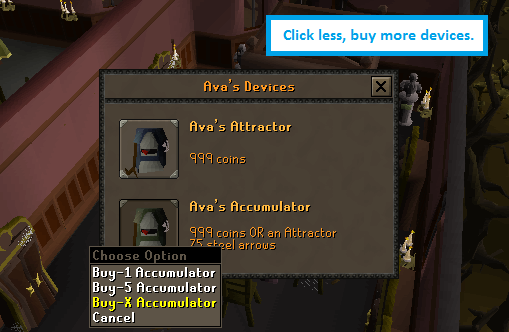 Another highly anticipated quality of life update that will be coming in April is the ability to buy multiple Ava's devices at a time. And, of course, the other remaining content that passed the poll will be released in the coming weeks. You can see exactly what content passed and failed content poll 30 and content poll 31 by visiting a poll booth in game. Can you fix NMZ this summer too? No gathering feedback/ideas for the upcoming slayer update? Everything stated here is forwarded from a major corporation. Nothing here is my opinion. Enjoy your salad.